Last week I noticed a jump (4 times normal) in the number of views on this blog when I posted about "Which is the smartest county in Ireland?" - I compared the 26 counties for total number of PhDs, and followed up the next day with a breakdown for men and women. It was interesting to note the wide discrepancies between the counties with high numbers of PhDs and low numbers. Today I'm taking a quick look at some more Small Area Populations Statistics (SAPS) from the Central Statistics Office (2011 Census). You can already see that there is a less dramatic difference between areas than for doctorate degrees. Dún Laoghaire-Rathdown comes out the highest with 14.5% of the adult population having a degree or professional qualification. Galway city, Fingal, and Dublin City are next on around 10% each, with surprisingly (to me) South Dublin lagging behind on 8%. County Offaly is the county with the lowest number of percentage degrees on 5.5%. Despite the presence of the University of Limerick and Limerick IT, Limerick City has the second lowest proportion of degrees at 5.7% - interestingly Limerick county is on 7.7%. 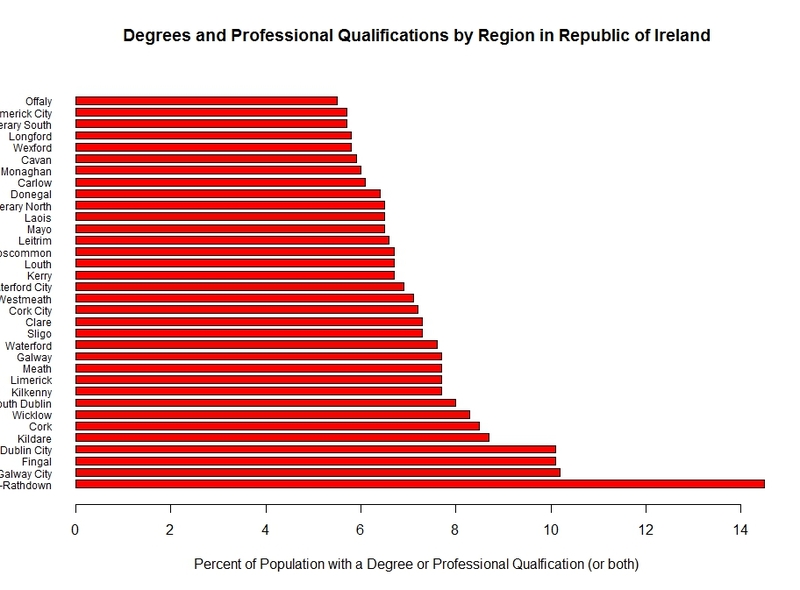 As with the PhD data, counties and areas where there are no Colleges (with the exception of Limerick) tend to have a lower proportion of their populations having a degree or professional qualification. I don't think we can read into these data that there is an educational divide between rural and urban areas. Urban areas are where the jobs are for people with degrees, so I'm guessing that the differences are due as much to this rather than there are (for example) less Offaly people with a degree than other areas. Tomorrow I'll take a look at comparing men and women in each area.